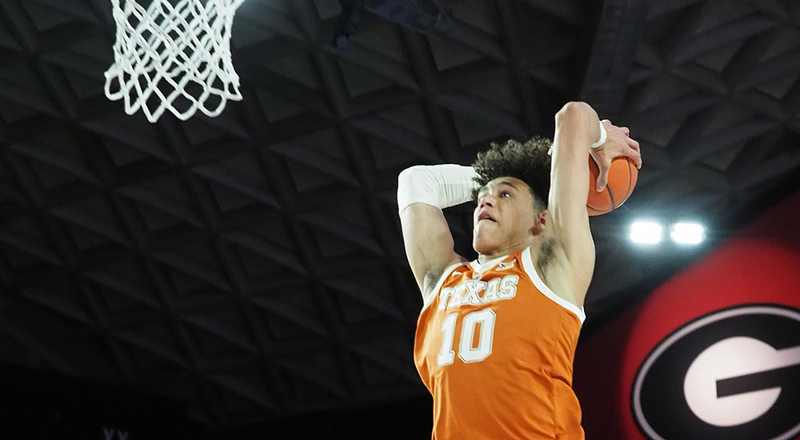 Freshman forward Jaxson Hayes followed a 2018-19 season in which he was named Big 12 Freshman of the Year by declaring his intention to enter the NBA Draft (photo courtesy of texassports.com). AUSTIN, Texas — Forward Jaxson Hayes’ first season as a member of the University of Texas men’s basketball team will be his last. Hayes has declared his intention to enter the NBA Draft and will sign with an agent, the school announced Thursday. “First, I would like to thank God for giving me the opportunity to play this game I love so much,” Hayes said. “Next, I would like to thank my family, the entire Texas coaching staff and my teammates for helping me get to this point in my career. I'm so appreciative of Coach Shaka Smart for pushing me every day to improve and mature, both on the basketball court and as a person. I would also like to thank everyone else who has helped support me. Lastly, thank you to all the Longhorn fans and the people of Cincinnati who have been there cheering me on the whole way. Whichever NBA team ends up selecting Hayes will get an über-athletic, 6-foot-11, 220-pounder, whose first-year production just scratched the surface of the potential offered by the tantalizing prospect. The Big 12 Freshman of the Year was a second-team All-Big 12 honoree and a member of the conference’s All-Defensive Team, All-Newcomer Team and All-Freshman Team. Hayes was the Longhorns’ third-leading scorer after averaging 10.0 points per game. He finished second on the team with 5.0 rebounds per game and led the team and finished third in the Big 12 with 2.22 blocked shots per game. He also converted 123 of 169 field goals, to shatter the record for the highest single-season field goal percentage in program history: 72.8. The previous standard was the 65.4 percent shooting by Dexter Pittman in 2009-10. Hayes played in 32 of the Longhorns’ 37 games, starting 21. He watched the team’s run to the National Invitational Tournament (NIT) title from the bench with a knee injury. “I’m really proud of Jaxson for the tremendous attitude he’s demonstrated all year and the unprecedented growth that he's made," Smart said. “He'll always be a part of our Longhorn basketball family, and we look forward to supporting him in the next steps of his journey."